According to a new mobile app monitoring startup called Crittercism, iOS apps are crashing at a greater rate than your favorite Android apps. 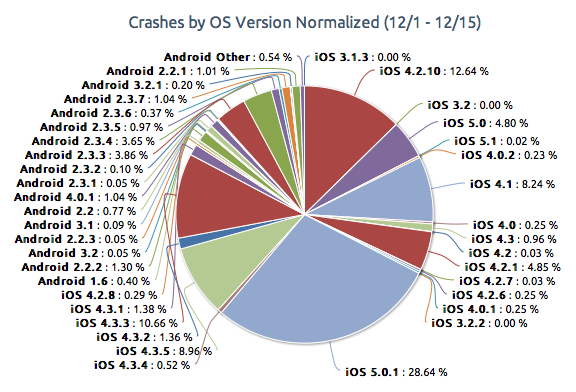 For a 2 month period, a ton of data was compiled and broken down by OS version and in some cases by app, and then into quartiles to give a better representation of the crashes. In the end, there was a clear winner (if you want to call it that), but some of the reasoning for this result is what we need to talk about. Now, not to bring up that whole ridiculous “fragmentation” argument for the 1,010th time, but just take a quick glance at the chart above. As you can see, Android is not the only leading mobile OS on the planet that has its fair share of older builds floating around on devices. In fact, through this study, Crittercism discovered that there were at least 23 different versions of iOS and 33 of Android. Lastly, the overall numbers that were presented are nothing for anyone to be overly concerned about. Sure, we can brag it up for the next few hours to our iOS counterparts about how their apps are less stable, but the truth is that apps on both platforms are crashing at less than a 1% rate. We aren’t talking about apps crashing 10-20% of the time or anything here. Both operating systems are stable, Android just happens to be slightly more stable.